Allan Aubrey Boesak, second youngest of eight children was born in Kakamas, Northern Cape. He grew up in Somerset West, attended Danie Ackermann Primary School and graduated from Gordon High School in 1962 at the age of 16. He studied Theology at the Theological Seminary of the Dutch Reformed Mission Church, was ordained in Immanuel DRCM in Paarl in 1968 at age 22. In 1970 he started advanced studies at the Theological University at Kampen in the Netherlands, and was awarded a Doctor’s degree in Theology in June 1976, a week before the Soweto Uprisings. He returned to South Africa to become Chaplain to students at the University of the Western Cape, Peninsula Technicon, and Bellville Teacher College, and then minister at Bellville DRMC. 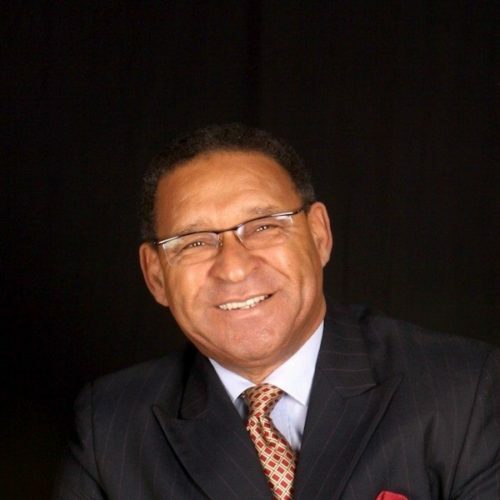 Dr. Boesak served the church in various ecumenical positions, including as Moderator of his church, Senior Vice President of the South African Council of Churches, and President of the World Alliance of Reformed Churches. Under his leadership the WARC declared apartheid a sin and a heresy and suspended the two white Dutch Reformed churches in South Africa for their moral and theological justification of the apartheid system. Over the years, Dr. Boesak became a world renowned liberation theologian and a coveted speaker at world events, beginning as key note speaker at the World Council of Churches Assembly in Vancouver, Canada in 1983, and most recently gave the keynote address at the Parliament of World Religions in Salt Lake City, Utah, USA in 2015. Dr. Boesak’s involvement in public life and South Africa’s freedom struggle began in 1976. In 1983 he called for the formation of the United Democratic Front which would grow into the largest, nonviolent, non-racial anti-apartheid formation in the history of the struggle. He became their most visible leader at home and abroad. He worked with President Nelson Mandela, Archbishop Tutu, Rev. Frank Chikane and a whole array of world leaders to end apartheid. Dr. Boesak is recipient of thirteen honorary Doctor’s degrees and several awards, among those the Robert Kennedy Human Rights Award and the Martin Luther King Jr. Peace Award from SCLC. Recently he was inducted into the Martin Luther King Jr. International Board of Preachers at Morehouse College. The author of 22 books, Dr. Boesak has taught across the world, and continues his teaching and preaching, while remaining active in global struggles for human rights. Currently he serves as Distinguished Professor of Religion and Social Justice at Berea College, Kentucky. He is married to renowned investigative journalist Dr. Elna Boesak. The couple have two daughters.